Finally we made it: An important milestone in SWARCO's internet history has been reached with the relaunch of a brand-new homepage on 1 February 2019. Right in time for our 50th anniversary. 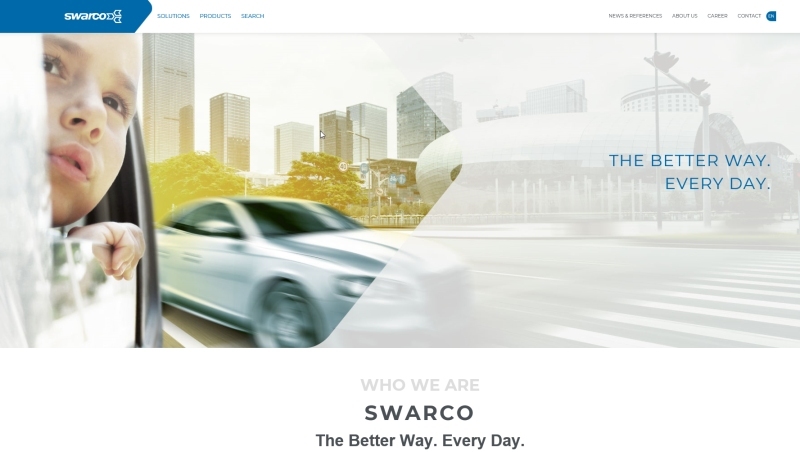 A crucial project within our internal strategic programs has been the relaunch of SWARCO’s website. A little more than fifteen months ago, a team of communication and marketing colleagues from different SWARCO companies started to work in detail on creating a new look of www.swarco.com with regular interim reports to the steering committee. Right from the beginning we took care to get inputs not only from the local marketing managers interfacing with the colleagues in their companies, but also from our Solution Managers in order to integrate as many interests as possible. The greatest change, which is a consequence of our brand strategy pushing for the umbrella brand SWARCO, is that we now have only one brand website under www.swarco.com and no more individual company websites. There is a clear focus on our solution capabilities, however without neglecting the numerous internationally successful SWARCO products in the different market sectors. This website will be available in a number of languages in the near future. The new site has been developed taking into account a userfriendly content management system, a fresh graphic look and Search Engine Optimisation (SEO) aspects. A lot of progress has also been made in our Employer Branding activities, presenting us as an attractive employer who is constantly looking for the best heads in the industry. A big hand to all SWARCO team members who helped in bringing this huge project to a successful end! Tell us what you think about our new internet presence! We look forward to your frank feedback under feedback@swarco.com.